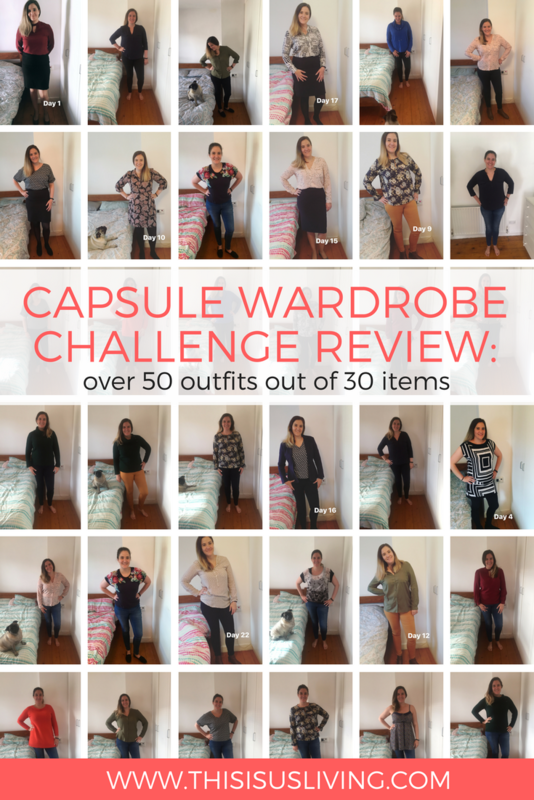 A few months ago I decided to document how many outfits I could wear out of my capsule wardrobe of 30 clothing items. So many of you were a bit baffled that I had cut my clothes down to such a “small” number. I think when you think of 30 clothing items, most just thought that would be like 15 outfits, and how could anyone be OK with wearing such few outfits. 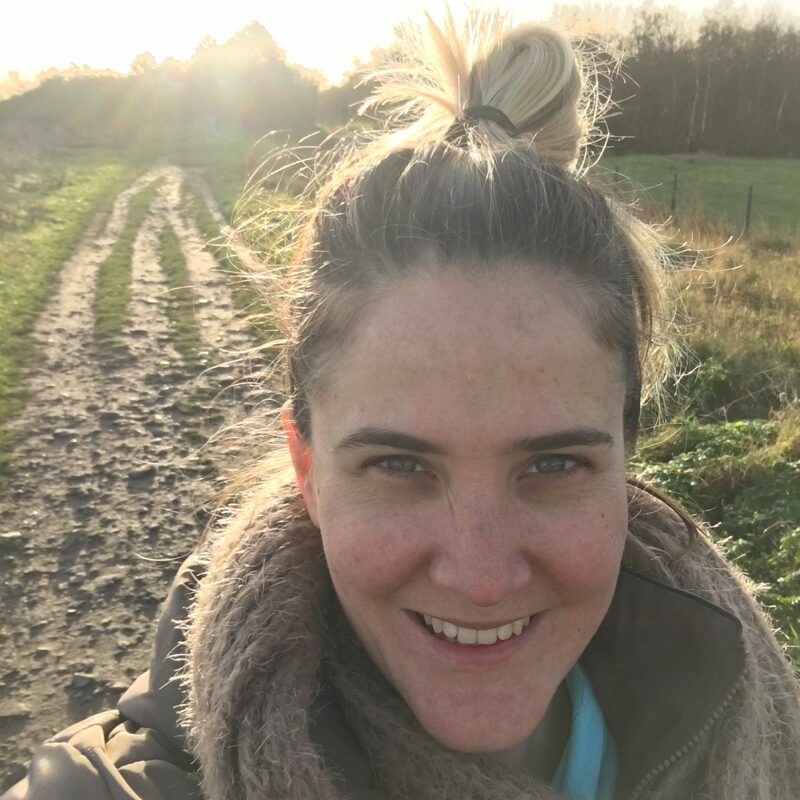 The truth is, long before I cut down all the clutter in my wardrobe, I was probably only wearing about 30 items of clothing on a consistent basis. I would wager a bit that most of us have our favourites we like to wear frequently, and that there is a lot of stuff we hold onto “just in case”; or “maybe one day”. I used to sit on the edge of my bed in my towel, wondering what could I wear today? The outfit selection and options used to overwhelm me, to the point that I often said I don’t have anything to wear! Since cutting down, and clearing out, my wardrobe is breezy and easy to see what I have and what to wear. Most importantly, I only hold onto things I love to wear and make me feel good! I had a few items extra, which I threw out as the challenge went on. I wasn’t keen on wearing them, or they didn’t fit well. So I gave them to the local charity shop instead. I also had a black dress, a jumpsuit and a fancy dress that I put in storage (since we don’t go to many fancy outings, it didn’t seem practical to keep them part of the 30 outfit count). 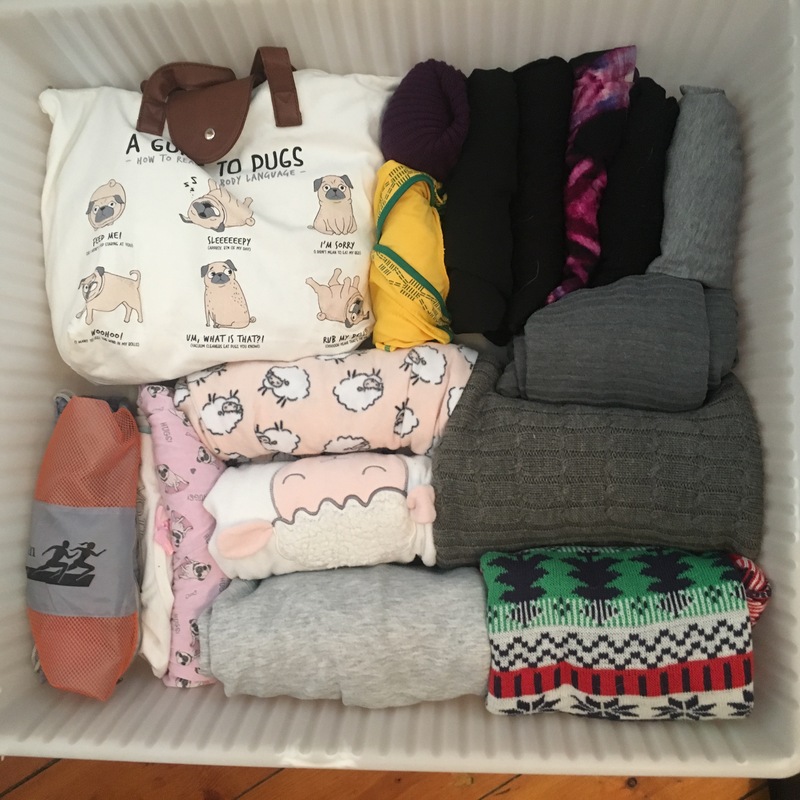 I have left my wardrobe on 24 items, to give me the opportunity to add some more warmer items as winter approaches. I also don’t think you need to be so rigid to keep 30 items because it really doesn’t matter what the number of items you own is, what matters is that you wear what you keep and you enjoy what you wear. No one cares what you wear. Not one person noticed if I had worn my red blouse the previous week, or if I had styled a completely new look. I no longer spend hours getting ready, less options means it takes quicker to get ready. I feel so light when I open my cupboard and can see everything I own clearly. 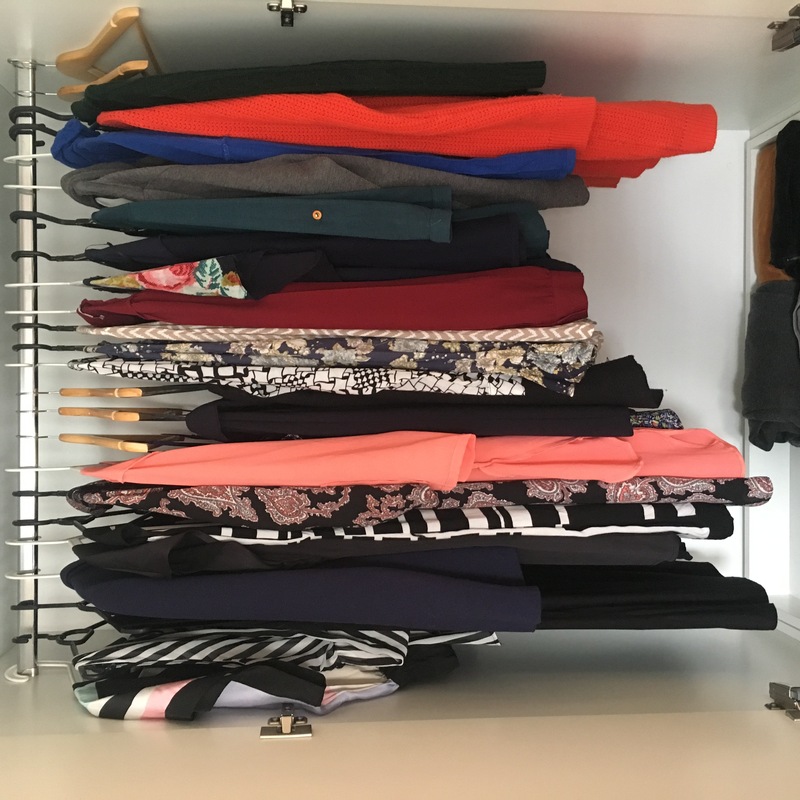 for a capsule wardrobe to really work, you have to really love the clothes you keep. Not kinda love – really love. It is possible to create multiple looks with only 24 items. I got to over 55 items, but definitely can think of more. If you plan on owning less, then make sure you buy quality stuff that lasts. Own some quality basic pieces (like black pants, jeans etc). You will wear these regularly, so its important that they last. 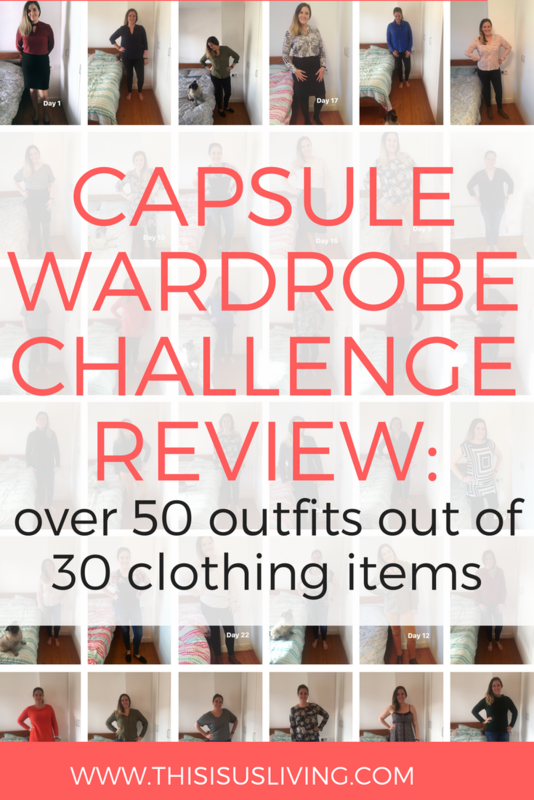 SO NOW THE QUESTION IS, WILL YOU IMPLEMENT A CAPSULE WARDROBE FOR YOURSELF? 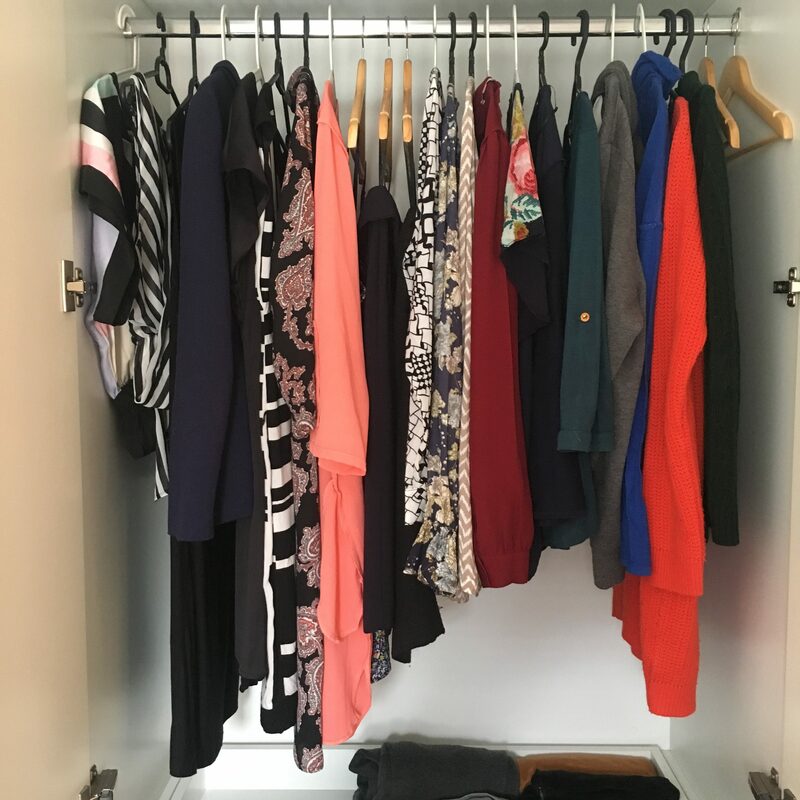 In April this year I set out to declutter my wardrobe, and wrote about how I got rid of all the clothing items that didn’t fit, I wasn’t going to wear, or just didn’t bring me joy. Since then, it has become a bit a talking point around friends as to how on earth I have continued to live with only 30 items of clothing in my wardrobe. 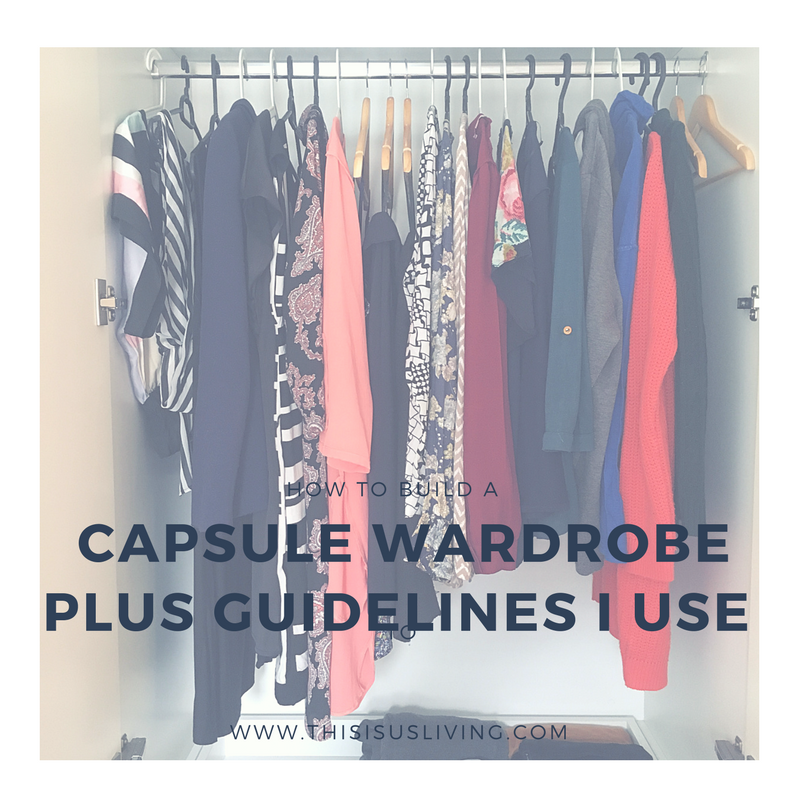 So I thought I would lay out what is currently in my wardrobe, and the guidelines I use to have a capsule wardrobe. 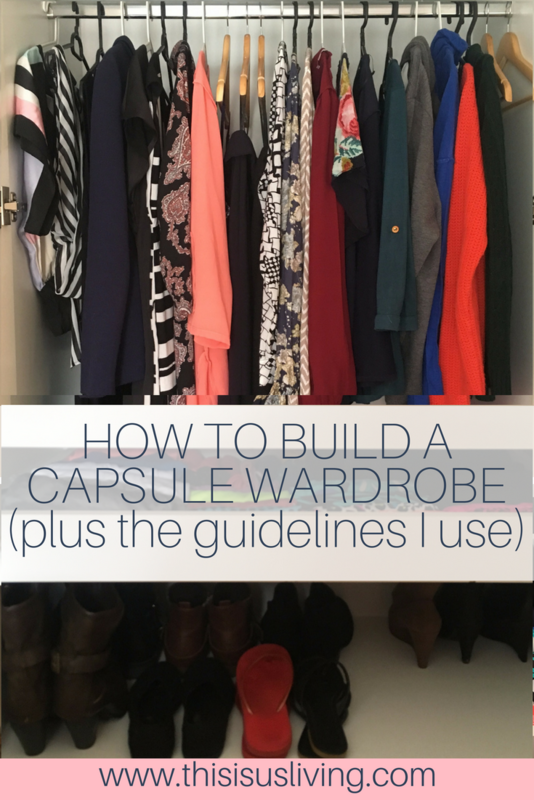 What are my guidelines for building my capsule wardrobe? I consider the above list, a list of everyday clothing items, things I wear either to work or casual or to a special occasion (like a wedding). I keep a few seasonal items in a storage container under my bed. Things like: winter jerseys, long tops I wear in winter, winter pj’s, a South African soccer shirt, 3 summer formal dresses, a house hoodie, and a small selection of clutch handbags, including some clutch handbags I got from my mum that I wear only for special occasions. There are still things I keep in my wardrobe that I need to work through. I would like to sort out my accessories, but I seem to hang on to these “just in case” – I don’r own a lot of scarves but I seem to favour one or two, but own about 8 in total. I don’t really wear jewelry that much, but I know when I start work I will wear a few items, so I am holding onto these until I start working to see what I wear and what I can get rid of. I know I need to sort out my workout gear. But honestly, this pile has been carefully accumulated to a number that is realistic if you run more than 3 times a week. At the peak of my training, I was running 5 days a week, and it saves on washing if I own enough outfits that I can run that frequently. 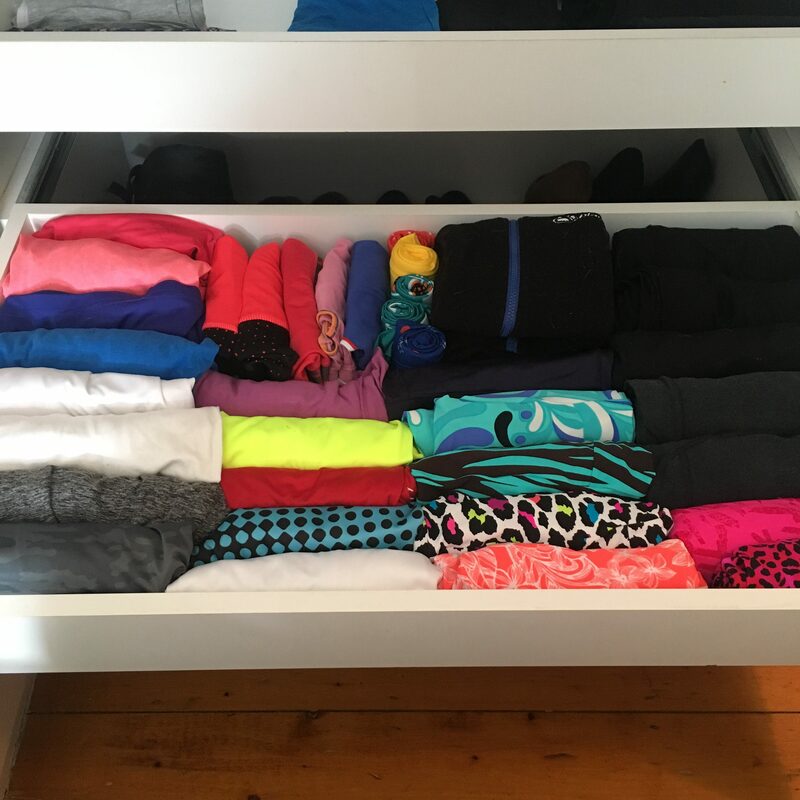 I have 12 pairs of running tights – this is because some are duplicates. If you are a runner you will know that when you find tights that don’t slip when you run, you buy duplicates because that is a rare find. But honestly, some of these tights are very light weight/ more summer gear, so it is not really helpful living in a country that I know I would probably not wear them, and rather stick to wearing the longer tights in my wardrobe. Still I find it hard to get rid of them because every pair of tights I own fit and work perfectly for me. I have 5 sport bras, but only 3 actually fit well. The thinking is that I have enough that I can run at least 3 times a week with only one wash cycle. But 2 of them fit terribly. Actually writing this has made me realise how stupid that sounds, so I am chucking the 2 sports bras that don’t fit right now. I know I should probably get rid of 2 pairs of heels. because I know that I will never wear them, and perhaps I can then replace them with 1 comfy pair of smart shoes I can wear at work. I don’t need to replace both. I know I only own one handbag, and it is a teal leather type handbag. But I really would prefer to own brown leather handbag, own that goes with a bit more of my outfits, as I sometimes feel the teal colour clashes with certain outfits in my wardrobe. Lay everything out and review all your clothes in one go. 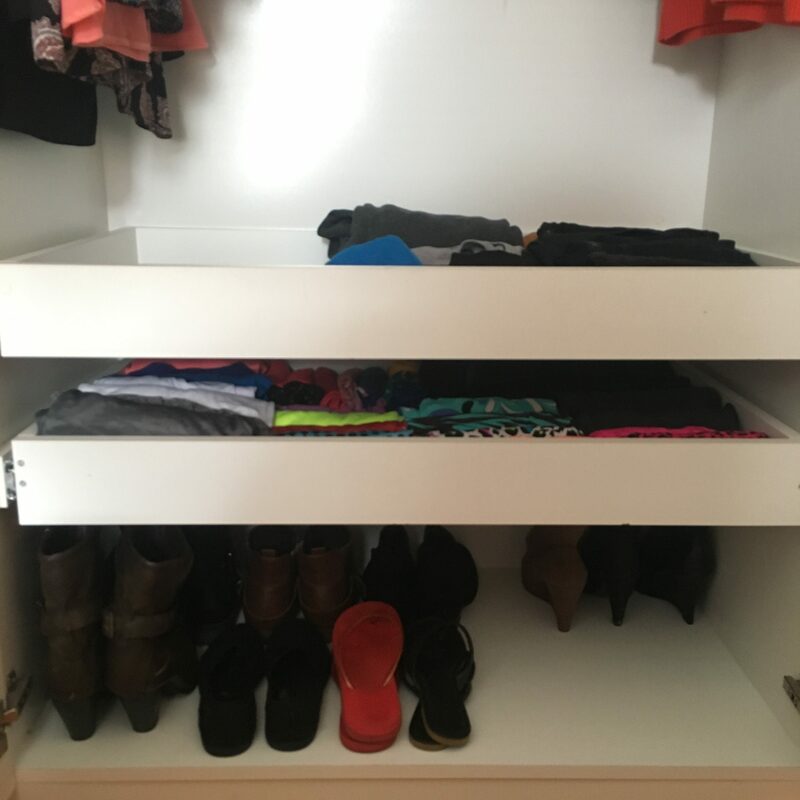 Pull it out of your wardrobe and pick up every item one at a time. Do you wear this? Does it fit? Do you like it? Would you buy it again? Work out the outfits you can create with the items you own. Match bottoms with various tops, or tops with various bottoms – do they all work together? Stick to styles that work for your body type. Don’t worry about matching exactly what I have, some things might not work for you. Perhaps you are not a fan of tights, or hardly wear dresses. Keep what works for you. Replace, don’t add. This is key, once you get rid of a lot of items in your wardrobe, your first instinct will be to go out and buy more to fill the void. Try living with less for a while. At the start, it will feel like you have nothing to wear, it will cause panic and anxiety. You will feel like you wear the same thing every day. Push through, because let’s be real, we all have our faves we always wear even with a wardrobe full of clothes! You don’t need to stick to black, white and grey. Often people think you have to stick with the same palette. I disagree, I love adding colours to my wardrobe – do what works for you! If you love an item of clothing, you will make it work for you in your capsule wardrobe. I think the key is that the separate items I have in my wardrobe can be mixed and matched, and create various outfits – regardless of colour. Think before you buy – do you need it? how will it work with the other items in your wardrobe? does it fit your style? Fold your clothes, and pack away in your wardrobe, so that everything can be see by just a quick glance. With everything in life, I know my closet is not perfect. There are items I know I need to still sort through, but right now, I am actually not sure if I need them. Perhaps I will use them in the future? So I have decided to keep what I have until November. That will mean that I would have had these items for one whole year, so then I can review again and get rid of the clothing I never wore in a year. 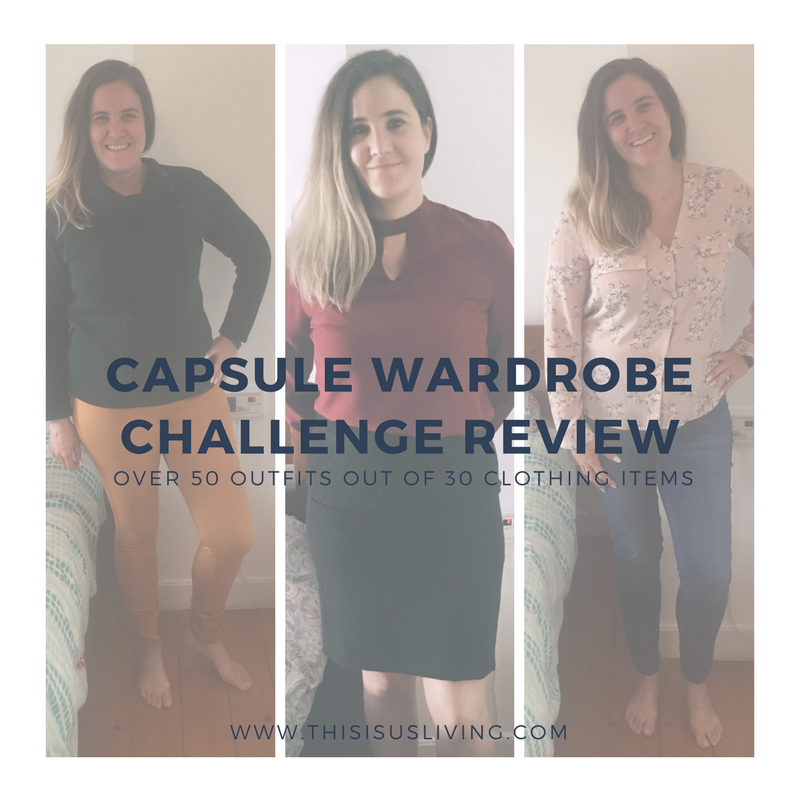 The best part of having a capsule wardrobe is that I can really see what I have in my wardrobe, and I know exactly what I wear and what I don’t ever wear but simply doing a quick scan. It makes it easier to manage. Nothing is hiding behind piles and piles of clothes. 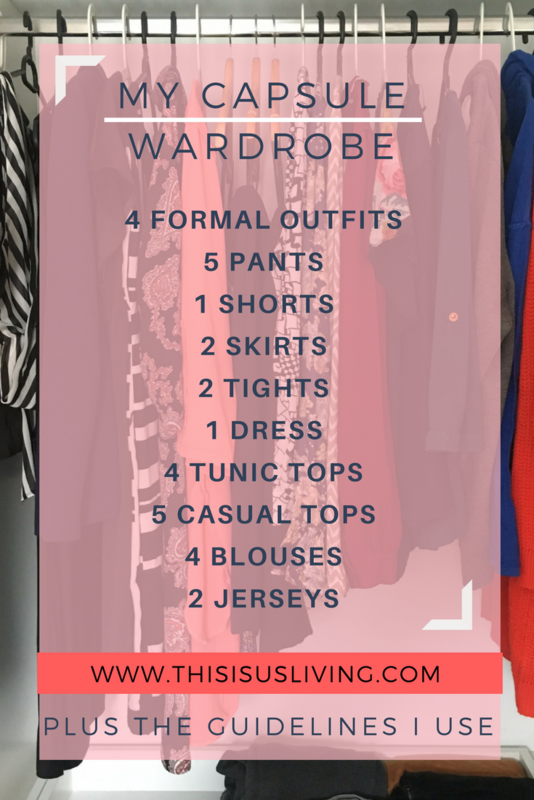 Everything has been accounted for and weighed up before I put it into my wardrobe, I love the order a capsule wardrobe brings. HAVE YOU TRIED THE DECLUTTER CHALLENGE?